Weinberger’s Furniture and La-Z-Boy Furniture Galleries are two of the most popular furniture stores in Augusta, GA. They’re both well-known brands and have been in business for years. We understand most people shop at multiple furniture stores before making a decision. And we want you to make the furniture purchase that’s the best fit for your home. 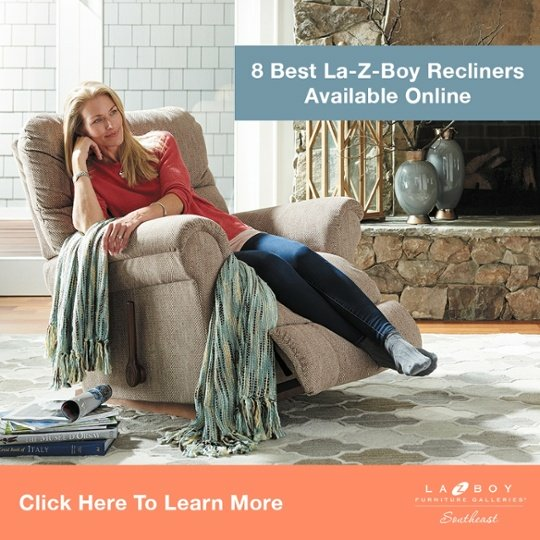 In this article, we take an in-depth look at 5 key differences between La-Z-Boy and Weinberger’s Furniture. Both La-Z-Boy and Weinberger’s have promotions that run throughout the year. This allows you to get a great deal on furniture every day. When comparing furniture on the basis of cost alone, both of these companies are very similar. La-Z-Boy is priced lower than Weinberger’s in some categories. Weinberger’s Furniture is cheaper in other categories. 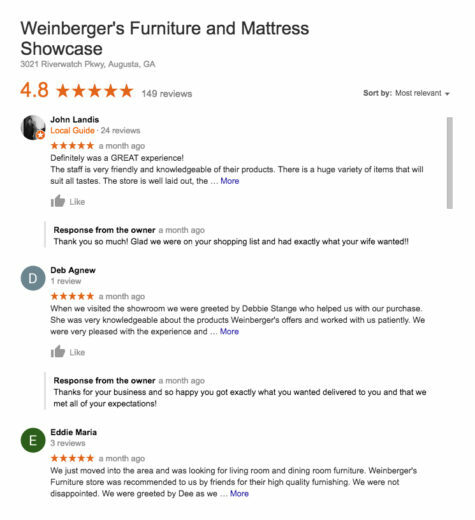 According to Google Reviews, Weinberger’s has a slightly higher rating than La-Z-Boy Furniture Galleries of Augusta, GA.
At the time of this article, both have around 150 reviews and Google Ratings around 4.5 stars. As you can see, both companies give exceptional experiences and it reflects in the reviews their customers post on Google. Furniture shopping can be overwhelming because you’re spending a lot of money and don’t want to make a costly mistake. Working with an interior designer makes the process of styling your home fun and easy. 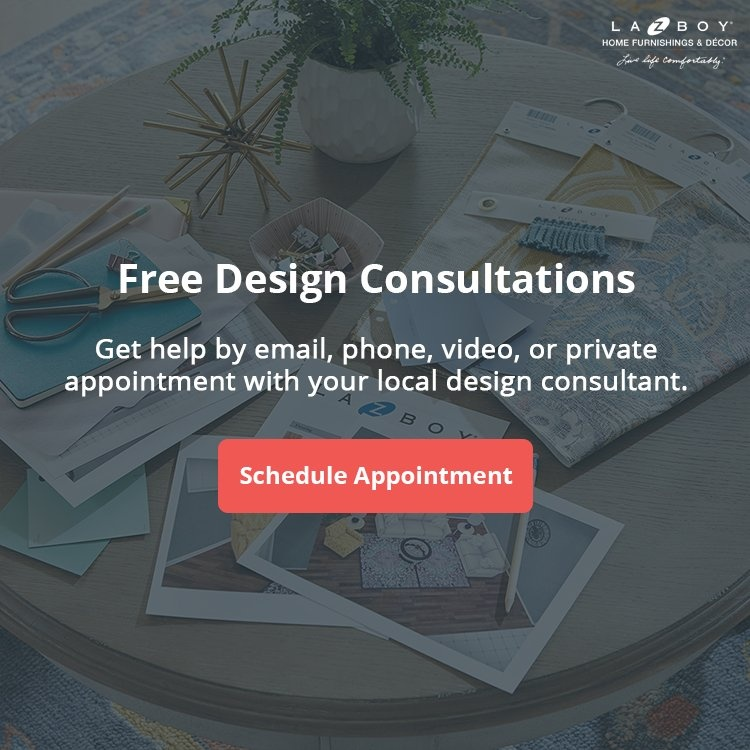 At Weinberger’s and La-Z-Boy, you can work with an interior designer for free and they’ll help you bring your dreams to life. 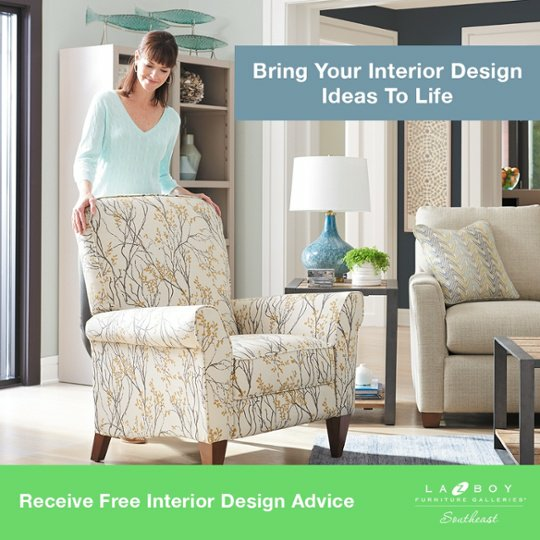 Here is a video with 5 reasons you should work with a La-Z-Boy Interior Designer. You can meet with an interior designer for free by booking an appointment online or visiting either of these furniture stores in Augusta, GA.
Weinberger’s carries a wide variety of furniture brands and they recently started stocking YETI and Big Green Egg. Both of these stores have the ability to furnish your entire living room, dining room, or bedroom. 5) Where Is La-Z-Boy & Weinberger’s Furniture Made? Weinberger’s carries more than 50 different brands of furniture that are made in different locations across the world. La-Z-Boy also sources most of the parts and materials used in their furniture from America. We’re proud to sell products made in the USA because they create jobs, support the local community, and are better for the environment. La-Z-Boy Furniture Galleries and Weinberger’s Furniture have a lot of things in common. They’re both well-known companies and have raving fans throughout Augusta, GA.
You can furnish your entire living room, dining room, and bedroom at Weinberger’s or La-Z-Boy. Plus, they both offer free interior design services. 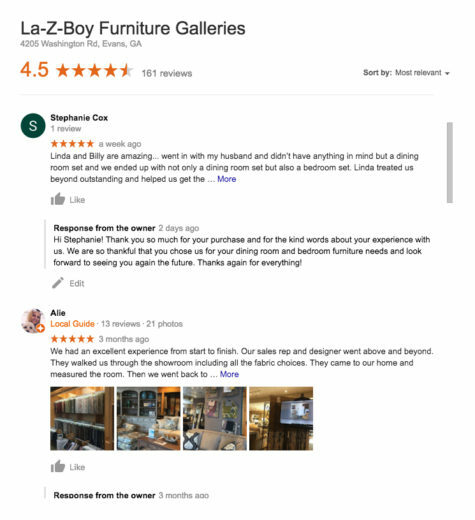 We would be happy to help you bring your dreams to life at your La-Z-Boy Furniture Galleries of Augusta, GA.